Our Documents is a collection of 100 documents that the staff of the National Archives has judged most important to the development of the United States. The entry for each document includes a short introduction, a facsimile, and a transcript of the document. Backmatter includes further reading, credits, and index. 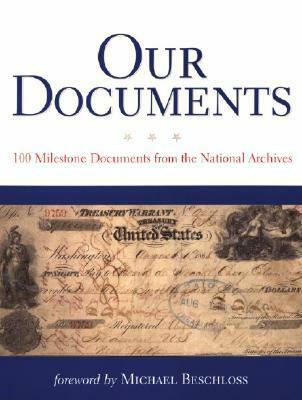 The book is part of the much larger Our Documents initiati Our Documents is a collection of 100 documents that the staff of the National Archives has judged most important to the development of the United States. The entry for each document includes a short introduction, a facsimile, and a transcript of the document. Backmatter includes further reading, credits, and index. The book is part of the much larger Our Documents initiative sponsored by the National Archives and Records Administration (NARA), National History Day, the Corporation for National and Community Service, and the USA Freedom Corps.